I have never watched a single minute of Duck Dynasty. Prior to recent weeks, I could not have given you the name of any of the bearded fellows. But now I know Phil. I have been blogging here since 2007. Besides the occasional link in a Six-Pack, I have never posted about homosexuality. If you enjoy labels, I suppose that I would be considered a conservative Christian from a mostly-Evangelical heritage. People I know personally and value deeply would claim positions on multiple sides of this multi-faceted conversation. Some of them would even defend those positions well. Perhaps more than any other conversation topic currently crossing my radar, dialogue around the topic of homosexuality highlights one word for me: nuance. Literally defined, nuance is “a subtle difference of or shade in meaning, expression, or sound”. Nuance is the intellectual and linguistic ability to pick up individual grains of rice with a pair of tweezers. As a speaker, this requires crystal-clear thought processes along with a finely tuned command of language (and one’s tongue). Within any bowl of rice, there will be some whose only utensil is a wooden spoon. These people should never be nominated as spokesmen for potentially explosive conversations. As a listener, this also demands graciousness, displayed first by a tendency to reply inquisitively rather than insultedly. Such a listener will live with the acknowledgment that numerous views exist upon spectrums that contain more points than “right” and “ridiculous”. Many of these points will only be discovered as nuanced speakers (mentioned above) enlighten us to perspectives other than our own. Listeners whose ears register only the frequency of their own voices will make as much mess of the rice ball as the wooden-spoon-speakers mentioned above. Duck-man Phil’s comments about the illogical nature of gay relationships are hardly shocking. His phrasing, containing blunt mention of male and female anatomy, certainly engaged ears. But his basic point is hardly controversial: We cannot imagine what we cannot imagine. I have friends who anoint every dinner in burn-your-face-off hot sauce. My mouth does not enjoy the fire or the flavor of such a condiment. I have no trouble declining their every offer. In fact, I cannot imagine desiring that sensation as part of my meal. To my mind, it is illogical. To Phil’s mind, some other things are illogical. And when nuanced speakers are heard by nuanced listeners, then it doesn’t seem outrageous to imagine that many heterosexual men and women likely share Phil’s sentiment, albeit their expressions of the thought might come out through a different sequences of words and images. As a student of Scripture, the piece of this large conversation that most interests me is the discussion of how we interpret the Bible’s teaching on the subject. I am not so out of tune with reality as to assume that every participant in this conversation gives a rip about the Christian faith or the words of our sacred text. But for my part, that is the strand that grabs my first level of interest. Everyone has a first strand of interest; now I have identified mine. By its very nature, the more specific discussion about gay marriage demands nuance. The Bible-believing, God-fearing faith-folks will require nuance to keep from the turning this conversation into something else. It is a separate topic to discuss whether Christian values should govern one’s nation. Who gets to determine this? On what historical or biblical model are you basing your concept? Are you speaking of the Christian equivalent of what we see in Muslim states where Sharia Law governs, or are you envisioning something else? It is yet another topic to consider what the role of government is within a democratic country. What does it mean that public servants represent the people, when the opinions of the people are all over the map? Shocking as this may be, democracy is not a biblical teaching despite the fact that some of its foundational thoughts might be a rooted in biblical concepts, such as the value of every individual as an image-bearer of the Creator. How are the elected officials within a given democracy expected to protect or provide the privileges described in their Constitution to every stripe of citizen under their care? In the handful of articles I recall reading, which provided commentary on Phil’s remarks, the majority of writers and journalists expressed bewilderment at a string of words within his opinion. The particular string of words were an impressively accurate paraphrase of Romans 1:21-27, provided below. 21 For although they knew God, they did not honor him as God or give thanks to him, but they became futile in their thinking, and their foolish hearts were darkened. 22 Claiming to be wise, they became fools, 23 and exchanged the glory of the immortal God for images resembling mortal man and birds and animals and creeping things. As acknowledged earlier, some could not care less about Romans 1, or the apostle Paul, or the fact that Romans is one of the most profound texts in the entire Bible. But for some of us participating in the conversation, these are substantial facts. And it is words like those, with 2000 years or more of mileage, that intrigue me most. Critics of the “traditional interpretation of the Bible” (This phrase gets used – sometimes for distinguishing, sometimes for dismissing – by people with a wide range of views on Scripture) point out that the Bible’s explicit mentions of homosexuality are few, with most references coming from the Old Testament. Bible-loving individuals, whose theology lacks nuance, often attempt to throw down their “God says so” trump card before anything of value is on the table. Even if one believes wholeheartedly in a holy God who governs the morality of the universe, calls for nuance go out one more time. Your cause is not served well by flippant phrases or careless commentary. If the Kingdom of God is as central as you say it is to the reality of the universe, surely there are wiser ways to dialog — even disagree — with those holding opinions not your own. In speaking of the Bible, it’s a fairly simple concept that not every portion of Scripture is equal in weight. The Bible is not a flat text, with every word dwelling at equal elevation. For some, this concept is shocking. For some, this concept is enlightening. I am not even implying that the Scriptures referring to homosexuality are insignificant. I’m simply pointing out that a lack of theological nuance can cripple any conversation centered upon Scripture. Going beyond McKinnon’s strategizing for “attacks” and “debates”, the art of nuance is more than a battle scheme. It’s a good life skill for expressing care toward others and for learning from those unlike ourselves. It’s a move of grace. It’s a method of wisdom. And it’s not always modeled best by folks whose lives revolve around bird-hunting. If Phil strikes your chord, that’s your choice. But as for adding nuance to this, or any other potentially dicey conversation, that’s your duty. Occasionally, I compose short pieces for our church bulletin. While most would consider 250 words or less shorter than the ideal blog post, allow me to share one such recent post below. If such articles are useful to you or your church for similar use, consider permission granted. Please just tag on my blog address for the sake of reference. I find value here. There is a reminder to linger, to mentally sit with the reality of God’s steady and unfailing affections toward us. Life is fast, and days are full. Ideas and emotions, opportunities and obligations – these blast by and through us at blurring speed. And so the psalmist calls us to consideration of something secure and unchanging, something that holds us fast even when our grip feels like it is slipping. Today friends: Breathe deep. Sit still. Open hands. And consider the stable and stabilizing passion that flows from the Father’s heart toward you. Take root. Lean in. Consider it. One week ago, our city was rocking with the rhythms of Grey Cup 101. Among the “regular residents” with tickets to the event, a handful of bigger names joined the mix. 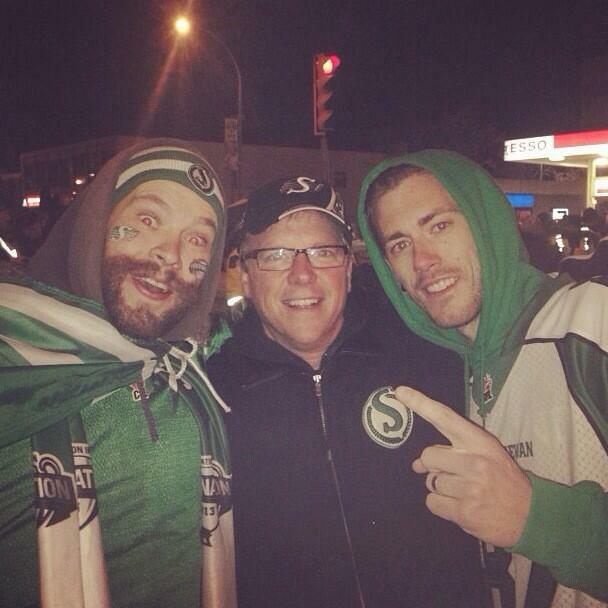 Saskatchewan Premier Brad Wall was hardly a surprising guest, diehard football fan that he is. Prime Minister Harper might be expected to make an appearance at our nation’s foremost sporting event. 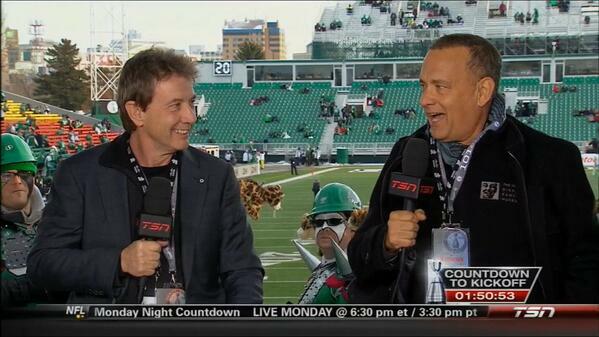 Martin Short and Tom Hanks upped the star power with their effort to bolster the Tiger Cats’ spirits as well. The presence of such people at last week’s championship was noteworthy but not entirely shocking. What was surprising, however, was these guests’ level of involvement in the festivities. My friend Jeremy snapped a picture with the Premier among the reveling masses on the Green Mile following the victory. 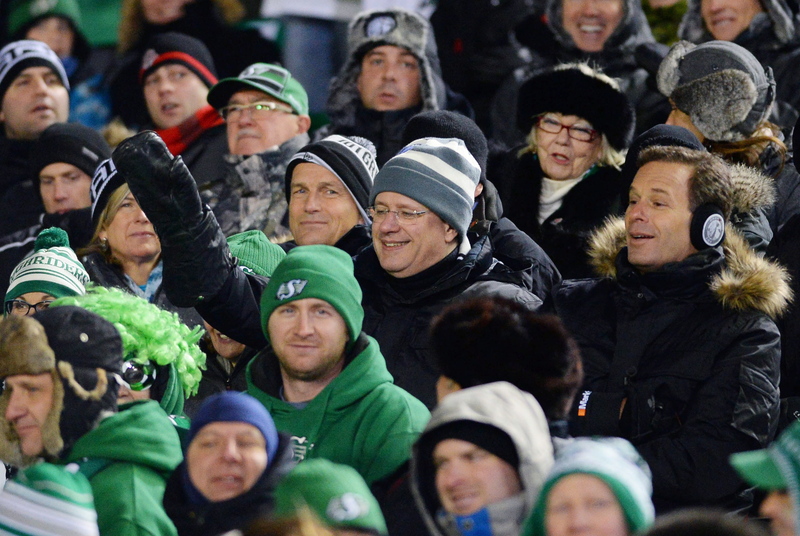 Our Prime Minister donned a toque and sat in the stands beside the CFL Commissioner. What are the odds that US President Obama will be free to mingle in the stands at Super Bowl next month? Minimal to zero, I suspect. And Martin Short and Tom Hanks worked the circuit, appearing on the pregame show beforehand, entertaining in the stands during the game, and joining the party on the field afterward. Two of Hollywood’s A-listers added some flare and fun to an already-lively mix, and Regina loved them for it! Full-blown participation is quite another. Joy has become somewhat synonymous with Christmas, but it is worth pausing to consider the source of Mary’s particular pleasure. She delights in God because He took notice of her and acted in her life. Mere presence would have been sufficient. By His omnipresent nature, of course, God was with Mary. He’s with everybody! To live with even a hint of His nearness is a blessing. Yet Mary celebrates that, like celebrities at Grey Cup 101, Yahweh is not merely present; He is profoundly participating. His knowledge of her is not distant. Rather His involvement with her is deeply intimate. She celebrates that His mighty power has touched down upon her life. He has moved her from a place of lowliness to one of exaltation. He has transported her from the humbled one to the honored one. He has called her from being common to being chosen. It is astounding to observe Mary’s ability to focus on two depths simultaneously. The human eye cannot do this. Yet she succeeds in noting (Lk 1:55) that the Creator has a plan reaching all the way back to Abraham (I would say even further back to Creation) and extending into the forever ahead of us. Yet hand-in-hand with this immense perspective, Mary is able to see her “here and now” in relation to God’s universe-filling scheme. This unwed, about-to-be-pregnant teenager declares to all of us that the works of God in our lives today – hard-to-interpret or easy-to-miss – somehow tie intricately into the Grand Plan. A reality deeper than the Grand Canyon is being carved. Something more sure than the oceans tides is being scripted. A monument more immense than Everest is being constructed. The plan of God is being carried out. And this moment in your life is somehow woven into that masterpiece. I’ve always wanted to love poetry. Many people I admire are poetry-lovers; I feel certain there is something to this. Already, I appreciate well-honed language and acknowledge the superior-to-the-sword sharpness that text can wield. However, apart from limericks, Silverstein, and Seuss, I confess to being a poetry failure. I struggle to enter and enjoy it as I wish I could. But Daniel Ladinsky may be changing that. An acclaimed expert on mystical poetry of the ages, Ladinsky spends many of his words translating these provocative pieces or creating his own, based upon the classic works he discovers. His book “Love Poems from God” is one of the only poetry books I own, once I get past Green Eggs and Ham and Mother Goose. Over a year ago, he blogged a typical-for-him piece titled, “Maybe the Best Lay in Town is a Poem”, a title that strikes me as a hard-to-ignore invitation into poetry-land! Below is one of his offerings. maybe it is just an alias. for my Beloved I never mention to others. All I can say is–it works. Beyond Moses, you have Jesus adding the consistent call to address the God of the vowel-less name as Abba — Daddy, the One your trust more than any other because His perfect love is evident in every dealing. Most of us (even those of us with great fathers) need to bring our imaginations into that equation, to redeem “Daddy” as a name void of disappointment or worse. When I swirl together these experiences and teachings of Moses, Jesus, and Paul, I find myself arriving somewhere near to Daniel Ladinsky, with an awareness that my names for God often limit, more than free, my interactions with Him. So for today, get on-board with Ladinsky. Recognize some of the names you use as nicknames at best, and draw close to God as the One who will be exactly Who He will be. Groan if you need to, and whisper confidently, even affectionately, to the One who is nearer to you than your breath. With Ladinsky, you just might agree: It works! In my last post, I noted a connection between Peter’s walking on the water and a great typing groove. At the moment that his feet felt his weight supported by the sea’s surface, Peter entered a supernatural experience. And for all of a few moments, he lived comfortably in a realm beyond himself. But it all ended as quickly as it began, and the unraveling began with something perfectly innocent and natural: some logical questions. 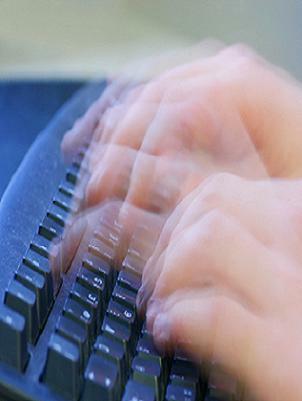 As I commented last time, typing at its finest involves fingers flying faster than brain waves. In that moment, the act of analyzing my movements is the wrecking ball that destroys the speed and ease. There’s nothing implicitly wrong with thinking – it’s just that there are realms beyond understanding, where mental clutching and grabbing snuffs out the beauty and power to which we’ve gained access. In his later years, Peter wrote (perhaps even typed at break-neck speed 😉 ) that in Christ, we are invited to participate in the divine nature (2 Peter 1). He speaks explicitly of being freed from the corruption that saturates the fallen order. But I can’t help but wonder if his mind didn’t wander back to his brief taste of water-walking. Certainly, those were some participating-in-the-divine-nature moments! And surely he recalled the ease with which he lived in those moments. Until he began to think. And it was his very logical thoughts forming very reasonable questions that ended what he might have later labeled as the very normal expectation of Christ’s people: Participation in the divine nature — life beyond ourselves. By grace, God invites us into a life far too big for ourselves. As children, our mothers bought us too-big clothing, assuring us that it was really just too-big-for-now clothing. The mom-mantra was spoken over us: “You’ll grow into it.” And we came to know that, quite naturally, we would. But grace is hardly natural. To be sure, God calls us into a life too large for who we are. But unlike childhood clothing, there is no natural guarantee that we will grow into what He is giving. In fact, left to our own soundest thoughts and stablest tendencies, we will wiggle ourselves out of it. Our doubts will be well-founded, and our concerns will seem wisely-conservative — and they will do exactly what Peter came to learn: They will lead us from the supernatural to the natural. They will do away with “beyond ourselves”, in exchange for “within ourselves” — and we will feel the loss immediately. TRUST. And direct that trust toward God’s power before you direct it toward your ability to comprehend. Getting this backward creates a bottleneck in one’s spiritual life. GRACE. God gives it freely, but be active in pleading for receptivity to this logic-defying gift. Any efforts to create formulas or square equations will be decimated by divine grace, so let them go. Or you can do it after God breaks your calculator. GRIP. Loosen it. None of us are big enough to be main characters in the grand Story. There is only One of those, and we find our wondrously appropriate identities solely in relation to Him. So breathe. And listen. And respond. God is good, and you are His. 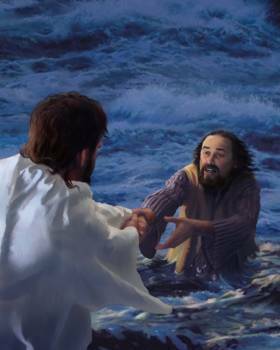 YOUR TURN: How does Peter’s sea-standing experience speak to your life of faith? What have you learned about living, by grace, beyond yourself? The reasoning behind Peter’s request has long been lost on me. How much easier to test the “ghost” by quizzing him on last week’s accommodations are inviting him to do a secret handshake. However, such thoughts betray my ignorance of discipleship. Within the relationship between Rabbi and disciple, there is always an aura of confidence. The Rabbi deeply believes that his disciples can become like him – they can do what he can do; they can be what he can be. Apparently, Peter has absorbed this sense of confidence, and it is worth noting that for all the criticism “doubting Peter” receives, there are eleven (or perhaps millions of) “believers” who are comfortably (and sadly) dry in their critiques. One fascinating twist on this story was recently revealed to me. It revolves around some simple questions: What exactly took place in those Peter-was-walking-but-now-he-isn’t moments? What actually happened out there? Hints toward our answers lie in Jesus’ closing question to Peter: “Why did you doubt?” We laugh at the apparently obvious answers: “How about we start with the wind and the waves, and we’ll go from there?” But weather reports are dwarfed by a basic recognition that we easily lose in the winds. Here it is. For all the confidence that disciple-Peter might have earlier absorbed from his Master, more than Peter’s knees were shaking now. The whole story makes me think of typing. I grew up on the border of technology, in that I actually had a typing class in high school. I remember it vividly because if you were quick enough to class, you found a seat at the luxurious electric typewriters. Pokier people got to build finger muscles by pounding the keys deep into the depths of their typewriters. Next door was the computer lab, whose machines held the reward for all of our digit-dancing devotion. All this to say: For all the skills my hands do not possess, they do type relatively well. But here’s what amazes me about typing. My hands can move significantly faster than my mind. To hit one’s keyboarding stride is a thing of beauty to the word-lover. It is a dance, in which ten small partners beat thoughts into text to a catchy clickety-clack rhythm. Sometimes, in the midst of a great groove, I will catch myself thinking. “Wow, this is a great groove. My fingers are really flying!” And at about that moment, I slow down. I respond, in an attempt regain my footing in said groove, by consciously pushing harder and faster. And the mistakes begin. Now I’m backspacing and grinding forward at a pace nothing like the earlier groove. I was functioning on a level beyond thought, so much so that the act of thinking — typically a helpful act — actually serves as an anchor sinking me back down to a more average experience. There is something profound here. And I’ll tell you what it is… tomorrow. A pastor born in 1935, now with two doctoral degrees, views his life work in this way. You are in here somewhere. Our premiss is this. It seems to us that there has been a ‘silent divorce’ in the church, speaking generally, between the Word and the Spirit. When there is a divorce, some children stay with the mother, some stay with the father. In this divorce, there are those on the ‘word’ side and those on the ‘Spirit’ side. What is the difference? Take those of us who represent the Word. Our message is this: we must earnestly contend for the faith ‘once delivered unto the saints’ (Jude 3), we need get back to expository preaching, sound doctrine such as justification by faith, the sovereignty of God and the internal testimony of the Spirit as taught by men like Martin Luther, John Calvin and Jonathan Edwards. What is wrong with this emphasis? Nothing. It is exactly right. Take those whose emphasis has been on the Holy Spirit. What is the message? We need to rediscover the power that was manifested in the Book of Acts, there needs to be a demonstration of signs, wonders and miracles; we need to see the gifts of the Spirit operating in the church – that the world will once again take notice of the church so that people are left without excuse. What is wrong with this emphasis? Nothing. It is exactly right. We believe that the need of the hour is not one or the other – but both! It is our view that this simultaneous combination will result in spontaneous combustion! And then, but almost certainly only then, will the world be shaken once again by the message of the church. This was the message I have preached over the years at Westminster Chapel in London. This is what we are endeavoring to preach in America and around the world. This is not all we preach but it is certainly one of the main things we preach alongside the need for total forgiveness and learning to be sensitive to the voice of the Holy Spirit. YOUR TURN: Where does your spiritual journey fit into this descriptions? What seems accurate about this assessment of Christianity and its message? What seems in accurate? Leave a reply–your input betters this post!